I am putting the Agenda for an Interfaith Prayer Service, entitled, “Just One,” up for viewing on my blog site. For well over one month, I have been promoting this idea in my local community, but so far nothing all that substantial has occurred. It is my understanding that for some the idea is too radical. I have sent it to a couple of international organizations also, whom I thought may be interested. So far, I have no response, and it is getting cold for the refugees who are still homeless and moving in mass across Europe. I thought if I would share it on the internet, someone might want to pick up all or part of the ideas and use them, even to help Just One refugee family. From my point of view, all the wars, nationalism, and military solutions to the world’s problems have failed and now is the time to consider a kinder and gentler solution to Evil, that of loving one’s enemies, of doing good to those who despitefully use us, and sitting down together at the same table in the presence of our enemies. I know I am just an activist radical, to think like this, but if it is beneficial to just one homeless refugee family, that is enough. Please feel free to take any or all of what I have written, and use it with or without permission for human good and decency’s sake. Below is some background concerning the process of trying to get this implemented, which has not yet happened, then the Agenda for the Interfaith Prayer event itself. If you would like a Word formatted document with color highlighting, please contact me via commenting on this document on WordPress. Thanks for asking me to further explain my plans for Tuscaloosans FOR Refugees. I capitalize FOR because that is the acronym which the Fellowship of Reconciliation goes by. 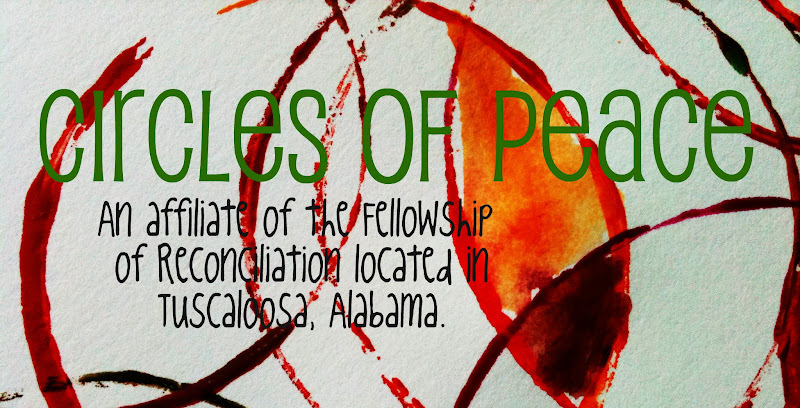 I am a member of the Fellowship of Reconciliation, the oldest Interfaith Peace and Nonviolent organization in the world, which is this year celebrating its 100th anniversary. This action is an action I am proposing partially stemming from my association with FOR, and also my long time, since 1969, beliefs in Peace and Nonviolence and social justice for all. I proposed this event to be hosted by ______________Church, where I attend. Although the Elders at _______________ Church decided it was beyond the mission and vision of _______________ Church, as I proposed it, ________________ Church was moved to action from my suggestions and prepared a video and commentary, and had corporate prayer at ______________ Church for the refugee crisis. It is possible some of this preparation from _______________Church could be helpful in this proposal. I realize what I am proposing is a pretty big plan, even for _____________________, but I remind you of Pope Francis’ call for every European Catholic parish to host one refugee family. What if every city in the United States and the world took in just one family? What if every faith based organization in the United States, and the world, including Christians of all persuasions, the Jewish Synagogues, and the Moslem temples, took in just one family… Just one, and Just one, starts with each of us, where we are, in our Faith based Trek. Notice that I deliberately capitalized “Just.” It is a matter of Justice, which all believers in the three great faiths care for the stranger, and the texts of the Jewish, Christian, and Muslim, and if one believes “just” in humanitarianism, which I have quoted in the proposed prayer service, indicate this very thing. I envision this as just not a Silent Prayer service, but as a seed that could grow into other cities, communities, and nations. I believe that Mercedes Benz, especially, as a major corporate presence in our community, whose Motherland is so graciously hosting many of the refugees, should participate eagerly, asking to bring in at least One refugee family and providing a job for the head of that household, even if the family cannot yet speak English, or German, even if it is just washing windows at Mercedes, cleaning bathrooms, or mowing the lawn. I believe that the University of Alabama should do the same, Just one family. I believe that the City of Tuscaloosa should do the same, Just one. I believe that ___________________ Church may wish to do the same, Just one. Other churches in Tuscaloosa may have the financial or Spiritual resources to do the same Just one. In fact, due to ___________________ asking me to clarify my request, my Vision of this is growing even greater. I believe our slogan should be “Just one.” I believe there is a “Just” God who is watching us to see if we have a heart for those for whom he had a heart, the wayfaring stranger, coming out of Egypt, the early displaced Christians, and millions and millions of poor, rat upon, sat upon, spat upon refugees who were at one time welcomed into this nation, the United States, who cried out to the world to “give us your poor.” What has happened to us? Can mankind repent of the hatred, war, and injustices which have never worked, and realize mankind’s mission is to care for the earth, to dress and keep it, in terms of the book of Genesis, and to be our Brother’s Keeper, also a concept from the book of Genesis? My prompting is to assemble a team of Catholics, Protestants, Jews, and Muslims, and humanitarians, to plan this event. Perhaps _______________ who is pretty good at putting together teams, might want to lend his expertise and name to this event. I believe it absolutely crucial for Mayor _______________ to be a part of this event. I have already been in communications with him and he has asked what time it would occur. I believe Mayor __________________will do this. If so, what an example that would be to the world, especially considering how our community was devastated by the tornado a few years ago, and how many came to help us in our crisis. We could also have a Sister City in Germany, who is hosting refugees. We believe that to bring Thankfulness for what has been done for us in the community of Tuscaloosa after our devastation, and to share our prayers and concerns as a community for the refugees, and to garner funds to donate for those actually doing the ground work of providing for the refugees, that we as Just one city, Just one Person, should take this action, to pray and share our resources as we are prompted, even if it is to Just one. Mayor __________________________welcomes all Faith’s and even non faiths to our humanitarian event in his own words and explains the Agenda. Interlude: Three minutes of silent Prayers by audience. “‘Hear the word of the LORD, all you people of Judah who come through these gates to worship the LORD. 3 This is what the LORD Almighty, the God of Israel, says: Reform your ways and your actions, and I will let you live in this place. 4 Do not trust in deceptive words and say, “This is the temple of the LORD, the temple of the LORD, the temple of the LORD!” 5 If you really change your ways and your actions and deal with each other justly, 6 if you do not oppress the alien, the fatherless or the widow and do not shed innocent blood in this place, and if you do not follow other gods to your own harm, 7 then I will let you live in this place, in the land I gave your forefathers for ever and ever. 8 But look, you are trusting in deceptive words that are worthless. 12 When you have finished setting aside a tenth of all your produce in the third year, the year of the tithe, you shall give it to the Levite, the alien, the fatherless and the widow, so that they may eat in your towns and be satisfied. 59:9. And (in this wealth there is also a share) for those (Ansâr, the Helpers) who had settled in the city (of Madînah) and had embraced the Faith before these (Refugees arrived there). They love those who migrated to them for refuge and (who) even though poverty be their own lot, found no desire in their hearts for that which is given to them (- Refugees) but they gave them (- Refugees) preference over themselves. And (bear in mind that) those saved from the covetousness of their souls are the ones to achieve the goal. 59:7-10 The statement: “That (wealth) should not circulate among your rich people” lays down the basic principle of social economics and justice. The less privileged groups of a society are described in this and the following four verses. The wealth is in the hands of few, but this wealth has been created through the labour of both the rich and the poor, therefore the less privileged should also benefit from the wealth of the rich. This social justice was introduced by Islam in the teachings of the Holy Qur’ân and not by any western revolutionary like Marx, or Lenin, who taught corrupted forms of this basic principle. It is significant to note that the wealth of the rich is neither condemned nor are any limitations laid on them. There are many challenges facing the international community today but few, in my mind, are more pressing than those of finding humanitarian solutions to refugee problems. We talk of regional conflicts, of economic and social crises, of political instability, of abuses of human rights, of racism, religious intolerance, inequalities between rich and poor, hunger, over-population, under-development and. I could go on and on. Each and every one of these impediments to humanity’s pursuit of well-being are also among the root causes of refugee problems. Interlude: Three minutes of thought and reflection audience. All are welcome to come to the table row by row and eat and drink from common food and common cup, each taking a small sip and breaking off a small piece of the food. People are welcomed to stay to fellowship as long as desired, or to come back to the table if food is left.